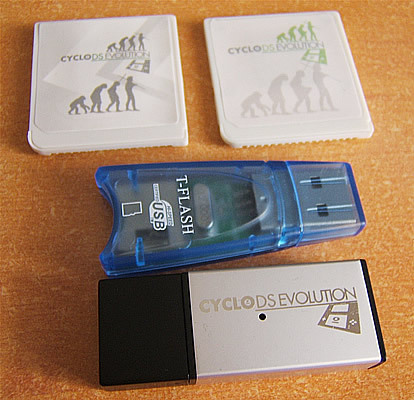 The CycloDS Evolution is a slot-1 flashcard manufactured by Team Cyclops, a European company that also have a few other products on the market such as the CycloWiz (modchip for Wii) and CycloDS slot-2 flash carts. 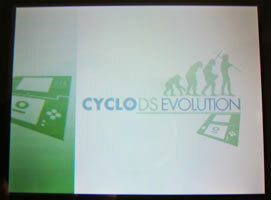 Today Homie and I will be reviewing the CycloDS Evolution. 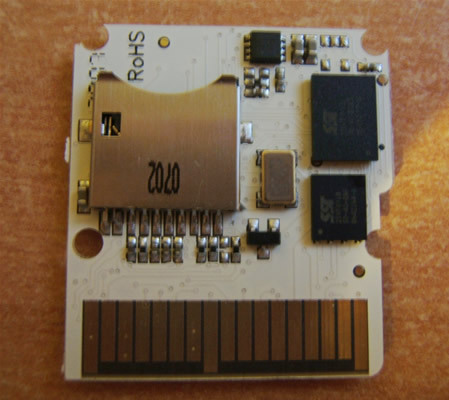 The slot-1 device comes packed in a small silver tin with a foam inlay, a list of features can be seen on the underside of the tin, as displayed in the picture above. 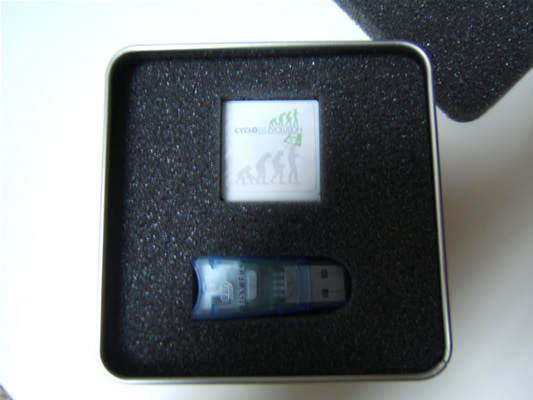 The contents of the package include: 1x CycloDS Evolution and 1x MicroSD USB reader. The USB MicroSD reader that comes with the v1 should really be considered a freebie and under no circumstances would I advise anyone to use the one they've supplied. The plastic casing feels flimsy, and is as cheap as they come. If this thing doesn't fall apart or stop working completely within the first couple of days of owning it then you've done well! My advice would be to buy a proper reader if you dont already own one. After all the complaints about the USB readers that came with v1 units they decided to include a new one for the CycloDS v2. 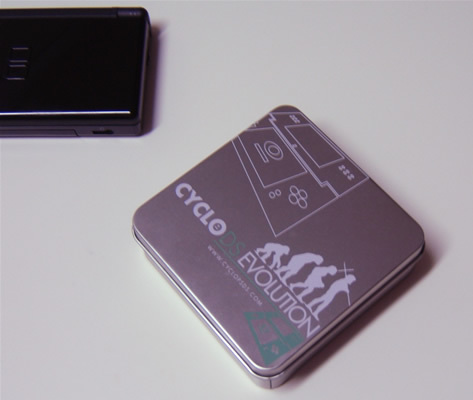 The new reader is much better quality and comes branded with the CycloDS logo, these should be safe to use and are'nt likely to break down after a few days. The card is the same size as a commercial DS game and fits flush in the DS. The plastic casing is strong and overall seems to be of very good quality. 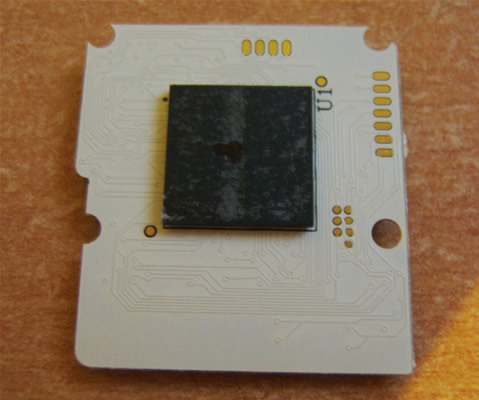 On the other hand the sticker on the front of the v1 Cylco is terrible, it looks like a small bit of low quality gloss paper thats been stuck on with a gluestick. Many people complained about the sticker and Cyclops team have changed it on all v2 units. Looking at the screenshots it might be hard to tell that the new sticker is of better quality but trust me it is. 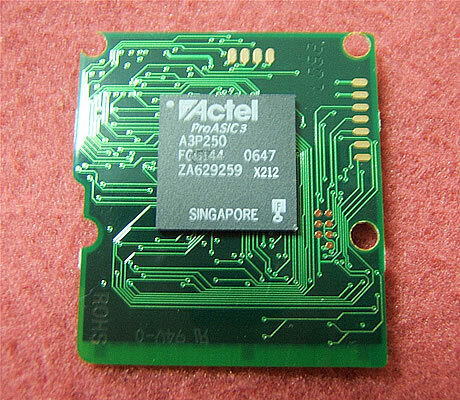 The PCB in the v2 model is of a higher quality than the v1, but the IC on the back of the PCB still sticks out of the card, as you can see in the pictures. Also the board color changed, maybe because the white ones seem to be cheaper and worse quality than the green ones. 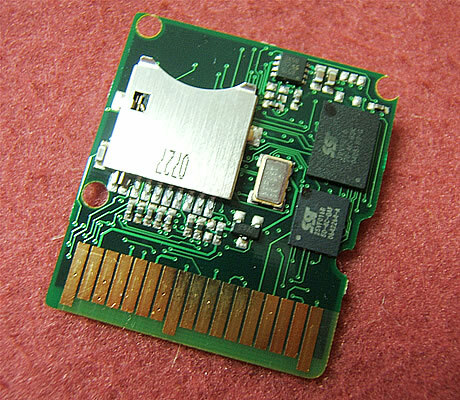 Also, the MicroSD slot doesn't have a spring like the R4/M3 Simply on both versions. 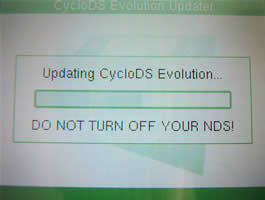 To update your CycloDS, you just need to drag and drop the latest upgrade file on to the MicroSD. When you boot the CycloDS Evolution it will ask if you want to upgrade. Choose yes and it will start updating, this process should only take a few seconds. After the update is done, the firmware file will be automatically deleted. Team Cyclops score! The CycloDS Evolution has a nice, clean looking GUI, from a design point of view you can see they created this with user friendliness in mind. The navigation controls can either be operated by the d-pad and buttons, or completely with the stylus. The stylus control on the menu is smooth, most other flash cards that offer touch screen controlled user interface don't have the smoothness that the CycloDS has. Skinning is also supported, so those of you that like to have their own custom skin wont be dissapointed. The user interface is also multi-lingual. 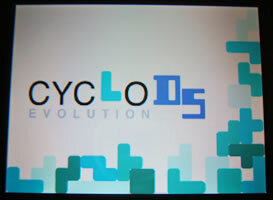 The CycloDS Evolution’s OS runs commercial ROM’s without the need for any patching. 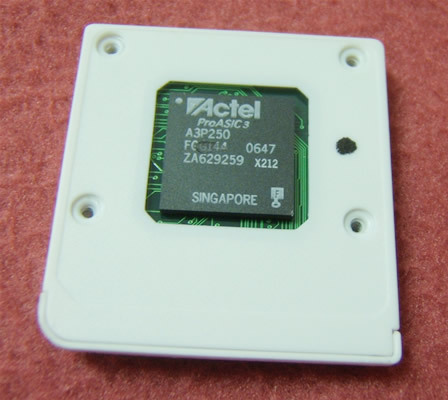 Simply drag and drop ROM files onto a microSD card and you're all ready to go. ROM loading is very fast, just browse to the game you want to play, press A or double tap the game to execute it. 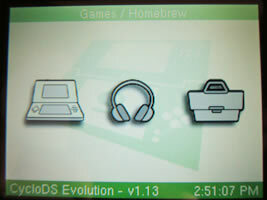 You won't need to apply DLDI patches to homebrew as the CycloDS will automatically DLDI patch homebrew software for you. 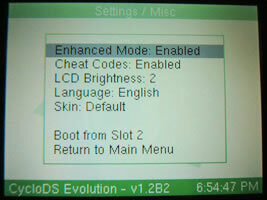 In this menu you can enable or disable cheat codes and Enchanced Mode. 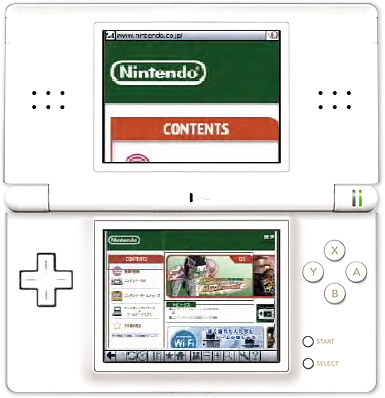 You can also adjust the LCD Brightness (DS Lite Only), change the menu language, skins and boot Slot-2. 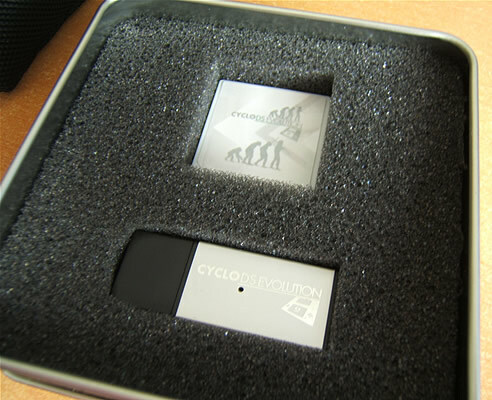 The CycloDS Evolution GUI is fully skinnable as you can see in the picture (Custom Skin made by Team Cyclops), the amount of skins it can access is limited only by the size of your MicroSD, unlike the limited amount on other flashcards. You simply drag and drop the skin files to the skin folder and you are good to go. You can select which skin to use via the Options Menu. If you have this option on, during gameplay press L+R+X+Y+A+B and this menu will show up. 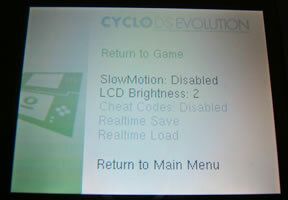 Here you can return to the CycloDS Evo main menu, adjust brightness (DS Lite only) and activate Slow Motion (3 different speeds). Also, if you activate cheat codes before playing a game, on this menu you can enable or suspend them. On the new 1.2 BETA #3 firmware a clock also shows up. 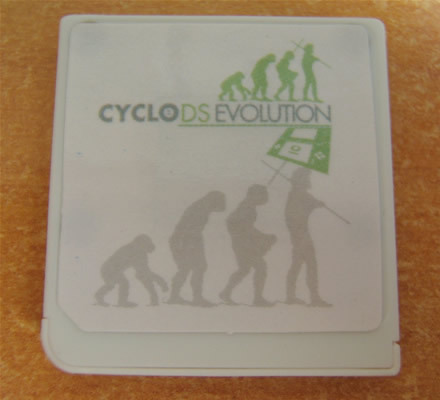 The CycloDS Evolution automatically patches the Opera Browser to use CycloDS/Supercard as RAM. 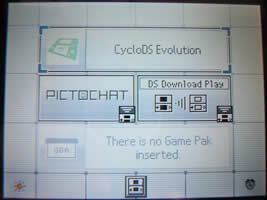 So you only need to drag and drop the clean rom on the micro-SD. There's not much to be said about this. 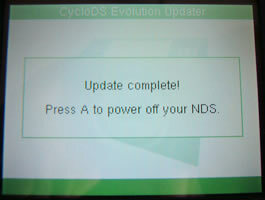 The CycloDS Evolution sets the rumble to the same strength as the original rumble pak by Nintendo. Also, it patches the Opera Browser automatically to work with it. 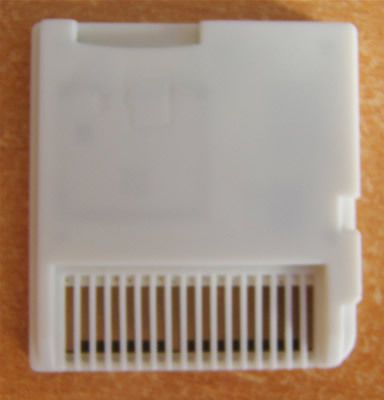 For GBA ROMs, I've used the latest Rudolph Tool (v1.9) and it worked with no flaws for both SRAM and NOR modes. The only game that currently supports DS/Wii connection is Pokémon Battle Revolution, and that connection worked with no flaws. 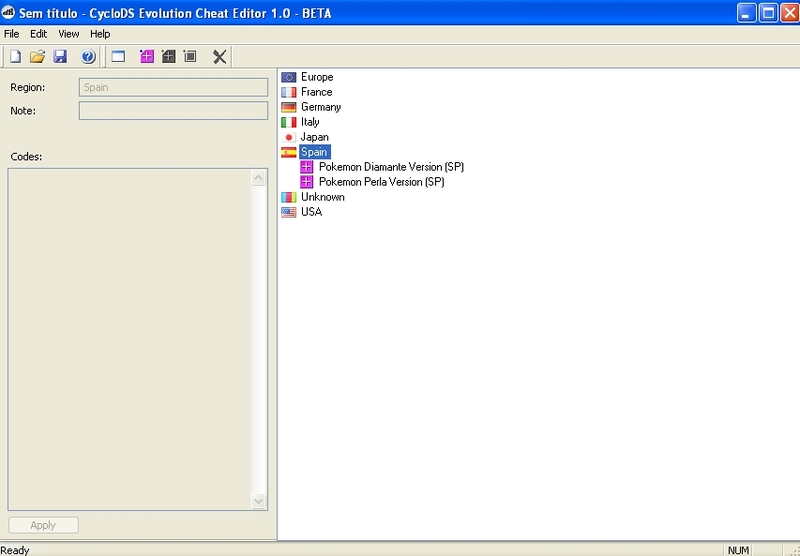 Cheat Code Editor: In the 1.2 BETA #2 firmware upgrade, Team Cyclops also released a Cheat Code Editor so you can add your own cheats and can even search for the latest cheats online via the Codejunkies server automatically. 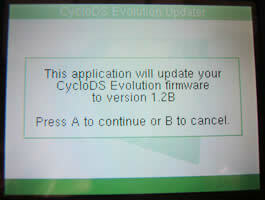 Hiding Folders: In the 1.2 BETA #3 firmware upgrade, Team Cyclops integrated a new feature. Just add a dot (.) before the folder name and it will disappear from your CycloDS menu. The compatibility with commercial roms was pretty much perfect, almost every game we tested worked fine and saved fine without any problems. Also, the Download Play results are as impressive as they've been advertised as (works 100%). These were the only 2 games that gave problems and in all fairness Tony Hawk's Downhill Jam lags on nearly all flash cards with a standard MicroSD card, I've heard that even the original game card has slow downs anyway so maybe this is not really an issue. E3 Tech Demo Table Hockey - After loading, the flashcard gives an error. Reported here. 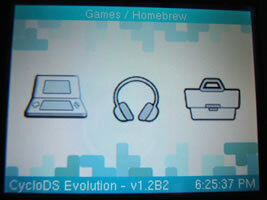 The CycloDS Evolution creates a save file without asking when you run the ROM for the first time. The save file is 512KB large and the format is .sav like most flashcards nowadays. Overall this is without a doubt the best flashcard on the market right now. This is the only flashcard that has exclusive features like Slow-Motion and in-game brightness adjustment. You can buy this flashcard for $54.95 USD on Kickgaming. It's not the cheapest but it's worth the money. 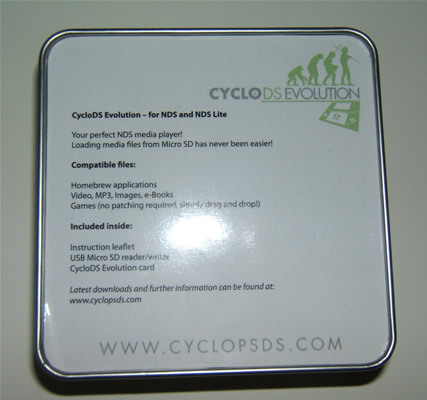 DS-Scene would like to thank KickGaming and Team Cyclops for sending us samples of the CycloDS Evolution for reviewing purposes. Great review Homie and Triforce! I still think the m3 simply is better! Yes, good review. So this card supports the MicroSDHC format that the R4 does not? If so this will probably be a purchase for me down the line. I hope they fix that ic chip sticking out the back by then. I also think the lack of a spring on the slot is a good thing, that always feels like it's just about to break on my R4. Proud owner of all next gen systems. 99.99% Game Compatibility means 1 in 10,000 games didn't work, that can't be correct. That's going to be difficult since they are a bit expensive right now. But as soon I get one, I'll update the review. Can't tell you if that's true since none of us actually owns the original game. This probably really offbase, but was there not an article on here like a month ago stating that the cyclo cards were just a copy of a supercard or was it a M3? Or have I confused 2 different devices and that was something else? Ahhh thanks for explaining that. It was already that long ago (looking at post dates)? Damn, time sure flies. Performed 11 Queries in 0.00403 Seconds. The page rendered in 0.9395 Seconds.